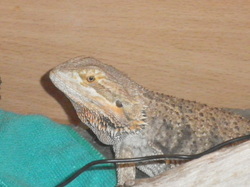 Charlie came into our care having lovingly been looked after since a hatchling. After two years of looking for a rescue for charlie we where chosen by her owner. 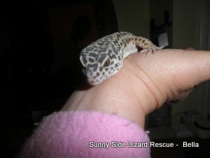 we would like to thank the owner for the trust she put in our rescue. Male Bearded Dragon this little mite had his tail bitten off after being kept in a viv with other bearded dragons. He was dominated by the others and was very nervous, dehydrated and under weight. On his own now he is doing very well in most areas. 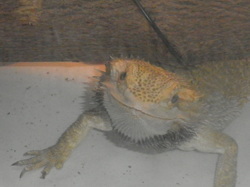 female very dominant and aggressive towards other beardies, slight dehydration was separated. Angel lovely character, but quite a stressful beardie, dehydrated under weight her behavior points to her being gravid (pregnant) unfortunately not a good time health wise for her. Will be updating this post, soon. UPDATE. 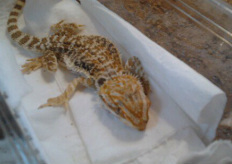 Female Bearded Dragon 1.1/2 to 2 years old. 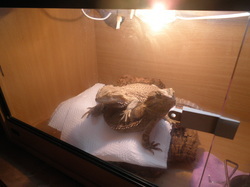 changing her diet of Locusts to a more varied live food diet including fruit and Veg. She was suffering from MBD thru lack Calcium and Vitamins, she was painfully thin from not having the correct diet and vitamins ect..
Poppy is very wary and nervous from not having been handled. She has a beautiful yellow colour. 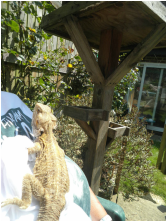 With the right nutrition patience and care, we hope Poppy will learn to trust again and become an energetic inquisitive beardie once more. REASON BOBO CAME INTO OUR CARE: BOBO WAS OFTEN LEFT ALONE AT HOME, PLACED IN THE WRONG ENVIRONMENT AND WAS UNDERWEIGHT. BOBO NOW HAS A LOVELY HOME WITH MATHEW. REASON ALLAMBEE CAME INTO OUR CARE: ALLAMBEE WAS NO LONGER WANTED, BUT WAS WELL LOOKED AFTER. REASON YANI CAME INTO OUR CARE: YANI WAS PAINFULLY THIN, DEHYDRATED AND ALSO HAD A DEFORMED JAW DUE TO LACK OF CALCIUM AND VITAMINS. 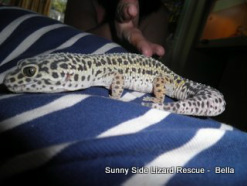 Unfortunately not all the lizards that come into our care can be saved. Yani, despite our dedicated attempt, passed away two and a half days after coming into our care. The breeder, in this case, has been reported to relevant authorities.